Those are all hexominoes. And before you ask, yes, that picture is from Wikipedia. 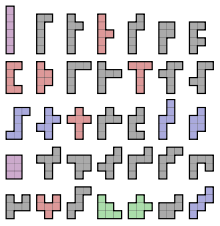 My question is this: can anybody find a set of $3$ or more distinct polyominoes so that, for each polyomino in the set, a polyomino similar to it can be constructed using the other polyominoes in the set? P.S. That last criterion is not essential - if you like, you could find a set in which, for each polyomino, a similar one can be constructed using all polyominoes in the set, including itself. P.P.S. I have no idea if it's possible. If you suspect it isn't and you would like to shatter my beautiful problem by disproving the existence of such a set, go for it. Take three 12-ominos: a 1x12 rectangle (A), 2x6 rectangle (B) and 3x4 rectangle (C). It's rather trivial to prove that it's possible to create enlarged copies of each polyonimo using only one of the others. L, square, and I tetrominoes. 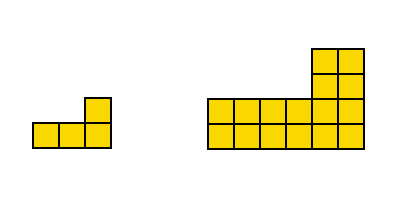 Each can easily combine with a copy of itself to make a 4x2 rectangle, and two of those can make any of those tetrominoes. 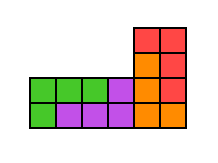 Like the other answer, only one type of tetromino is required.